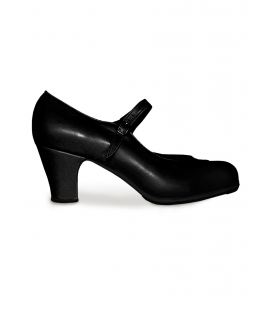 Flamenco dancing shoes with nails in toe and heel, specially designed for semi-professional dancers. You can choose it in black or beig. Their soles are made of rubber to make them more comfortable. This model has steel nails in toe and heel for a greater resonance. 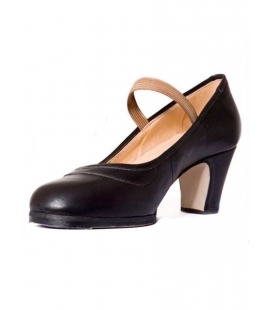 These shoes are ideal for semi-professional dancers. They are very comfortable and they adapt to the shape of your own foot. This product is made in Spain. 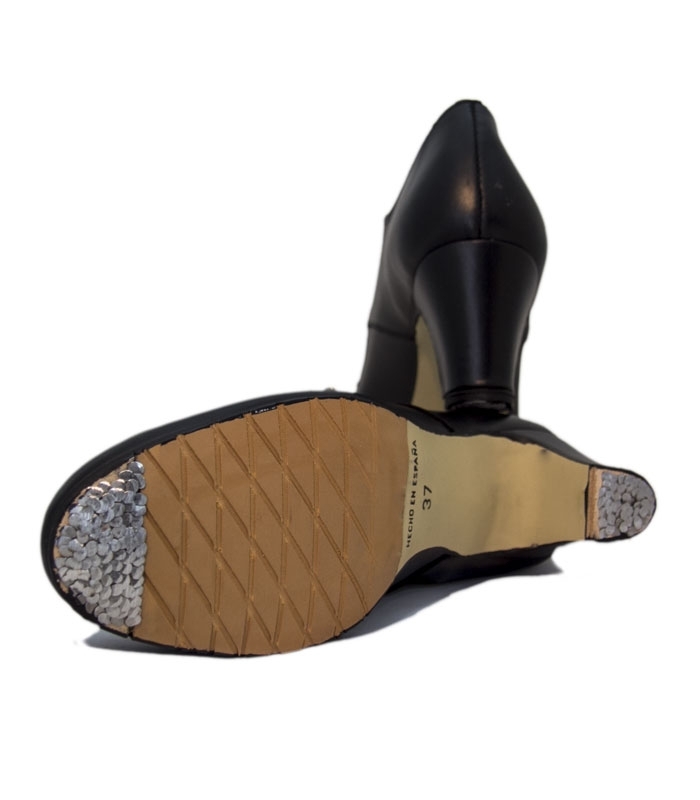 Flamenco dancing shoes with nails in toe and heel, specially designed for semi-professional dancers. 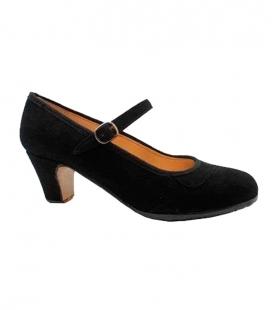 These shoes are made of leather and you can choose it in different colours; black or beig. Their soles are made of rubber to make them more comfortable. This model has nails in toe and heel for a greater resonance. 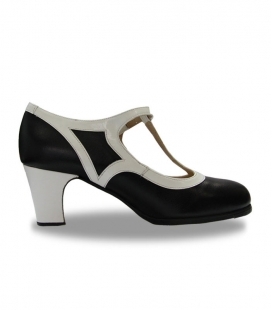 These shoes are ideal for semi-professional dancers. They are very comfortable and they adapt to the shape of your own foot. Flamenco shoes its is a special instrument in the flamenco culture, important for dance also the tap sound, the tap floor its escencial for fell the ritmo. all spanish costume must be incluid the shoes, its vital for make beautiful shows. for starting dance the semiprofesional it's a right choose because is flexible and light, comfortable for dancer who never tapped, when you improve your level you must change the shoes for professional because the sound improve and ideal in flamenco show, only recommended for professional because the shoes its harder no flexible for support the floor taps . All the damage done to the feet of athletes and dancers, usually is incorrect corporal-anatomy, for flamenco dance it's healthy use correct shoes, all flamenco shoes usually has elastic belt to get secure the heels for any movement, remenber when you buy at rocio shop, choose your real size on shoes no more than you are.The Rocio Shoes has a large last. 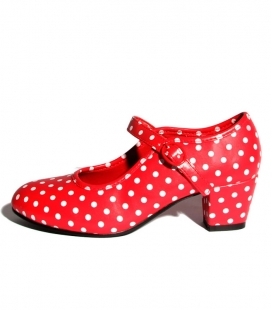 In this section you will find a wide range of Flamenco Shoes you can find tradiconal made-hand Flamenco Shoes for woman and Flamenco boots for men, with special offers which you can combine with our broad range such skirt women. These clothes for flamenco dancing are specially designed for semi-professional and professional dancers to wear them in dancing schools or in Flamenco show. These shoes are totally made in Spain with high quality materials. Choose among all these types of flamenco shoes and select your correct size. As flamenco wear company our goal is to offer customers quality and price in spanish dresses dance, shoes and all kinds of Spanish accessories. In our Spanish fashion shop online, we offer a selection of products also available in our stores located in Malaga and Granada. If you cannot find what you want, send email requests or suggestions and we will try to improve our Spanish dresses. 1-Toe taps down and stays on the ground. 3-Heel is lifted to tap down again and stays on the floor. 4-Toe (which has remained in contact with the floor during the heel taps) is tapped down and stays down. 5-Whole foot is now in contact with floor, raise, and strike the ground with a flat.